I believe you mean "pic-a-nic baskets"
I think you mean a matabooboo. Lyme disease is a risk in the UK too Slim, but luckily we don't have poison ivy, bears or the other creatures you have. Adders are our only poisonous snake, although a grass snake bite needs urgent treatment, not for venom, but for infection. Coyotes, yes. Infrequent black bear. Copperhead snakes not too far away from here. Skunks dig out yellow jacket ground nests. Really hope the PC / mouse interface gets fixed soon. This vintage XP laptop is so not what I'm used to using. our most dangerous wild critters either cause car crashes (deer hurt a few hundred folk a year and kill a few ) or kill folk with allergies to them like bees and wasps. our toxic spiders can give quite a nasty reaction to their venom ,afaik no fatalities recently but a few folk have spent a while in hospital . we have a few bitey natives and some exotics among those. a couple of years back i was nipped by an unidentified grassland spider which made my hand double in size for a couple of days . we have a few nasty fish such as the weaver but it is rarely fatal and quite a few that give a very painful stab with spines that have various toxic bonuses to the spikey aspect if you mishandle them. conger eel can be a bit scarey up close and personal but unless you fish for them they are unlikely to be a problem , if you do a claw hammer is a handy bit of kit. among the plants we have some stars of deception and toxicity , some of the water umbelifers are very special, foragers are quite rare and usually quite clued up about such things. if i was looking for toxins the flora of the uk (and its gardens) would be an ace place to seek such things. We have nettles here also. And giant hogweed is listed as a dangerous, noxious weed to be destroyed when noticed. Many of "your" plants happily make themselves at home - garlic mustard, anyone? Japanese plants are worse - kudzu (the vine that ate the South), Japanese honeysuckle, Japanese stilt grass. Multiflora rose. Phragmites. Japanese knotweed. I'm getting depressed, better stop. I think mother nature is pretty awesome at defending herself. 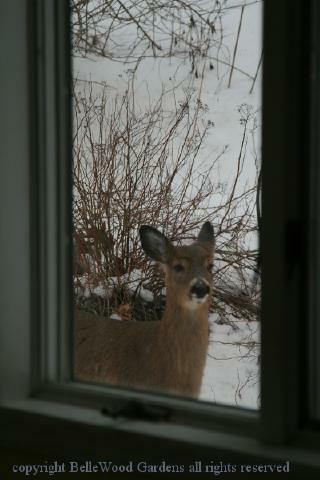 Deer looking in kitchen window. Perhaps waiting for coffee to go with salad bar / garden? Nice picture of the deer Jam Lady. I am glad to say that the deer stay in the woods and we only tend to get things like foxes in the garden. They seem able to climb over the garden wall quite easily. One year a vixen reared her cubs in the buddliah bed and the little pests played football with my onion sets. If you think that's good, there was a bear in that same area (same bear?) 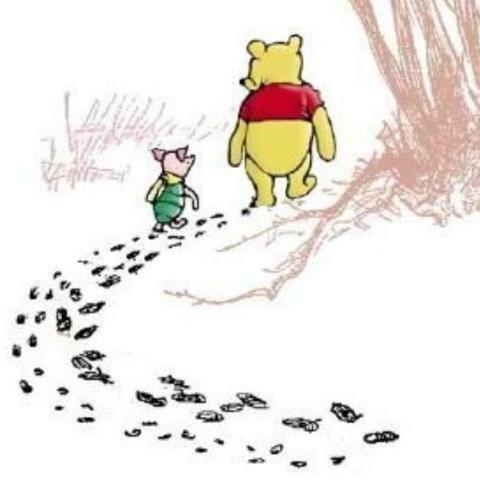 that I discovered had followed me through the snow. I came back to the spot I walked my dog through the woods the next day and found big ole paw prints nestled right in my snowshoe tracks for a length of our walk, crystalized enough when I found them that the bear was probably going through within an hour or two after I had (before the nighttime cold). You're being stalked by a bear? Probably rather less scary than if by some of the 'humans' who stalk people.